Process corn and other larger types of grain kernels …..
Our Salzburger grain mill – MAX SPECIAL – has been designed to process harder and larger types of grain kernels. As from September 2016 onwards our MAX SPECIAL mill features natural granite mill stones with a special stone cut, which will allow processing of harder and larger types of grain kernels. Process corn and other larger types of grain kernels …..
Soy- and other types of beans with a kernel diameter of up to about 9 mm. In many parts of Europe, processing corn with a household mill is an important subject and one to which we have dedicated our efforts, mainly due to popular demand by our Italian customers. More than 35 years ago our grain mill AM1 was first developed. Its technology and design were subsequently transferred to our MAX grain mill about 20 years ago. We have now adopted this tested and proven concept as the basis for the specialised processing of corn flour and other hard or larger types of grain. As from September 2016 our MAX grain mill features natural granite mill stones with a special cut for processing large and hard types of grain kernels. Even extremely hard, red corn kernels can be processed for polenta. Conventional corn kernels (such as e.g. the well-known Marcella type) can be processed even finer than semolina flour. Milling capacity: Up to 1 kg corn flour can easily be processed with this mill. The exact amount that is possible for milling in one process depends on the hardness of the grain and its oil content but at the same time as to how fine you wish the resulting flour to be. Types of Corn: We wish to point out, that there are many different regional types of corn kernels available. Some species of corn have such high oil content, that they cannot be processed with household mills, at the same time others are too hard to be processed even by MAX. Unfortunately, even we cannot process all types of corn and evaluate the resulting quality of flour processed. Many types of corn can be ground finely in one milling process. With others, it is better to use a coarser setting first and then to re-process the flour more finely. Fineness of the flour – bran: Like all cereals corn kernels have a hard shell called the bran. 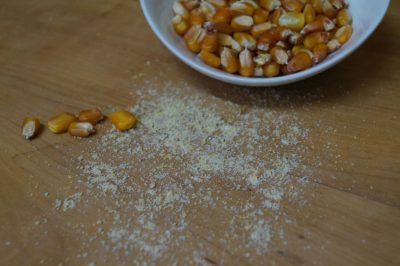 These shell particles appear in the corn flour as coarser particles. This is especially the case with extremely hard corn species. 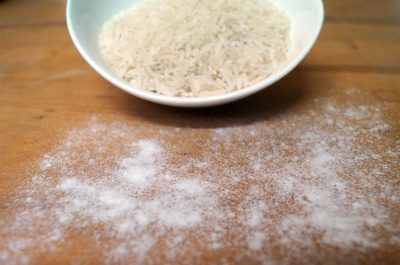 If necessary the bran can be removed by sieving the flour. Your locally cultivated corn: If you are not sure whether you’re preferred, regionally available corn is suitable for processing with our mill MAX, just forward us a small quantity (500-1000 g) and we will test the results for you. Solid wooden housing: Constructed from solid beech wood – a feature appreciated by every lover of natural products. The outer treatment with organic beeswax shows the character of the wood at its best. We pay special attention to the design of the milling chamber which is constructed solely from hard beech wood. In contrast to plastics, wood acts anti-statically and anti-bacteriologically. The geometry of the milling mechanism has been designed according to the results of our latest research – the stones are flexibly suspended, in order to better protect the mill against damage caused by foreign particles in the grain. echanism guarantees gentle milling of the grain helping to save energy and money! Single-handed operation makes selection of the degree of fineness required easy, on our grain mill MAX. The degree of fineness can be adjusted even during the milling process. You can let your children play at being millers. MAX is robust and child-friendly. However be careful! Only under supervision! MAX is so quick that the container is soon full. The Austrian 360 Watt industrial motor is compact and amply dimensioned, maintenance-free and not susceptible to interference. The integrated coil protection protects against damage caused by overheating. Milling capacity fine (wheat): ca. 90 g/min. The granite mill stones will be replaced free of charge should any damage to the same be caused by breakage or break out and so influencing the resulting flour output.